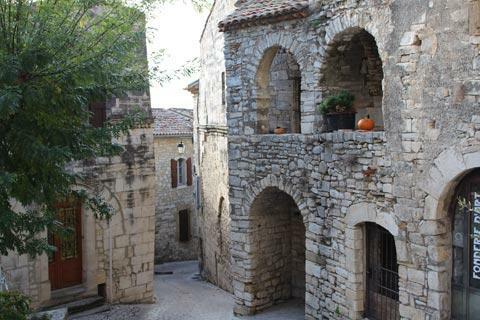 The region of southern France that lies to the north-west of Nîmes and south-east of the Cevennes National Park is less visited than might be expected, given that the very popular Pont-du-Gard is also to the east of the region. 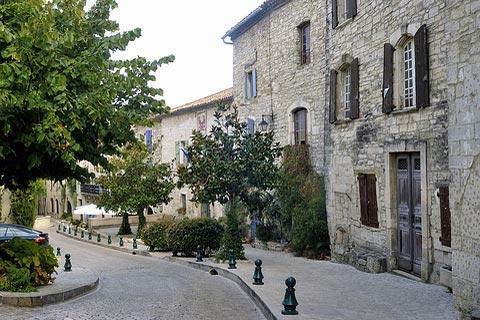 But take the time to explore this corner of France and you will discover that there are several interesting villages that deserve more attention - one of these is the village of Vézénobres which really is quite an undiscovered gem! 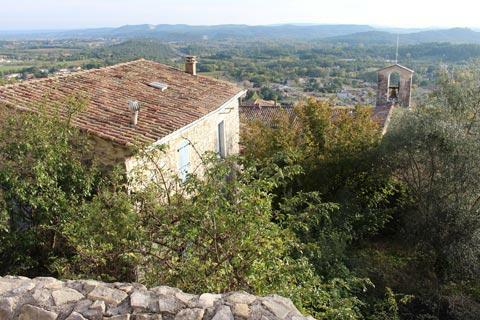 The historic village is situated on the side of a gently sloping hill and includes a good number of medieval houses, some of which are said to date from the 12th to 15th centuries, while more recent buildings are in the valley below. 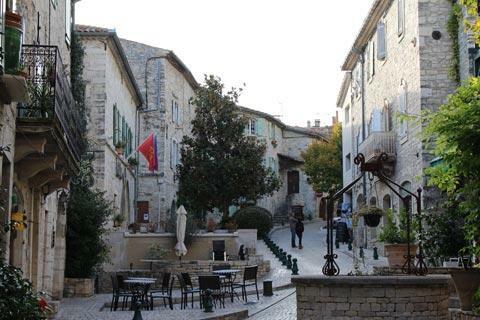 There is a large parking area below the village - cars are not permitted in the historic centre - so you need to walk up the hill to the village. No problem its a lovely walk with vineyards to the side of you and the village ahead so you don't notice you are walking up a hill! 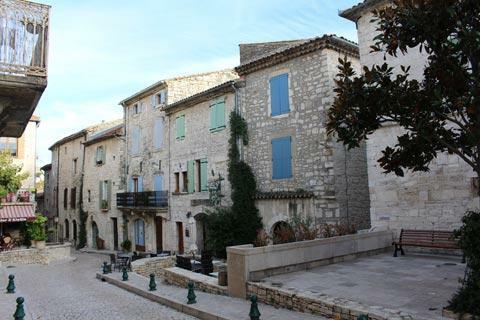 Among the notable medieval buildings in the lower part of Vézénobres is the Hotel de Montfaucon, with its decorative stone entrance, tower and lead-light windows and built in the 16th century by a local baron. 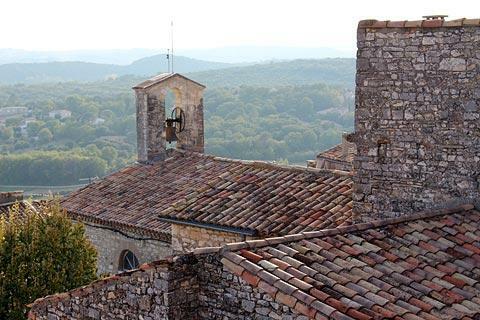 In the lower part of the town you can also visit the Church of Saint-André, above all to see the decorative 18th century frescoes in the apse. The brochure from Vézénobres tourist office seems to suggest the church was built in the 17th century, although the facade has the appearance of being considerably older. France This Way comment: although I mention various notable buildings here, the charm of Vézénobres really lies in its authenticity and the charm of the streets and the views across the countryside rather than in any particular monument: it is most certainly one of our favourite villages in the region! 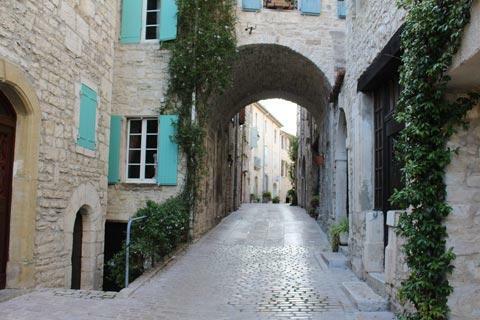 Many of the roads in the village centre have impressive houses in the roman style of architecture and exploring these narrow cobbled streets, in places interconnected by covered stone staircases, is the principal pleasure of your visit. Many of the ancient houses have interesting architectural features, unchanged over the last 600 years. 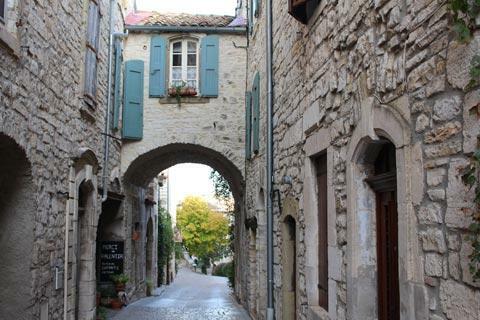 Not surprisingly the road called the 'Rue des Maisons Romanes' contains some of the nicest of these houses. I had never come across the idea of putting a glass roof over a whole section of a medieval alley but they have done it in a section of street in Vézénobres and it is a great idea - it creates a sort of indoor gallery without at all spoiling the charm of the street. 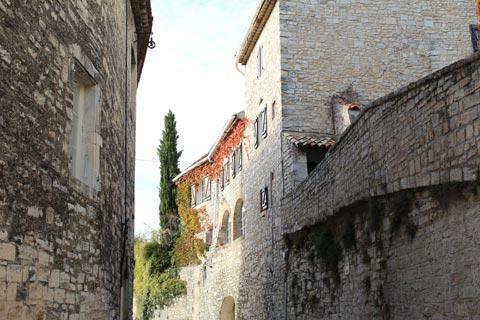 You will also come across various terraced areas as you climb through the village, with far-reaching views across the region. In the medieval period Vezenobres was centre of the local fig growing industry. The figs were dried on the terraces, which explains why there are more of these on the south-facing side of the hill. Another structure dating from the 15th century is the Porte de Sabran, now used as a clocktower and belltower (there is a simple campanile on top of the tower) and originally one of the five gates that allowed entry to the medieval town through the defensive walls. The others have unfortunately been lost over the centuries. 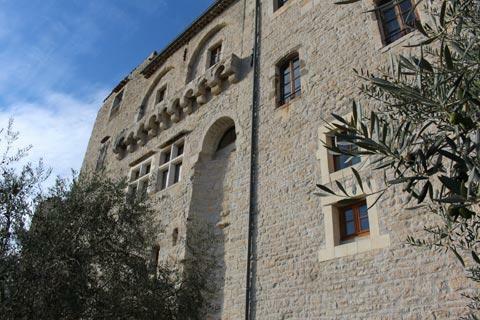 Also incorporated in these ancient walls is the Chateau de Thoiras, built in the 14th century. 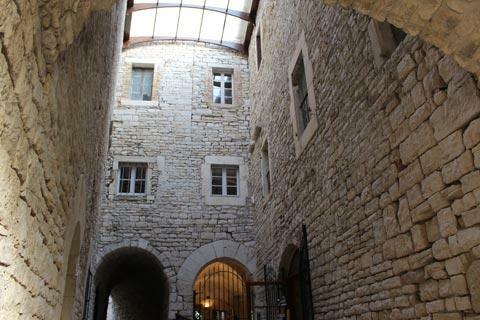 The building has enjoyed various uses over the centuries, and is currently where you can find the Vézénobres tourist office and the mairie, and a small exhibition area in the vaulted area below. At the top of the hill you can see the ruins of a castle (the Château de Montanègre) that stood here in the 12th - 13th centuries. Unfortunately very little now remains of the original building, but you can still enjoy the views. 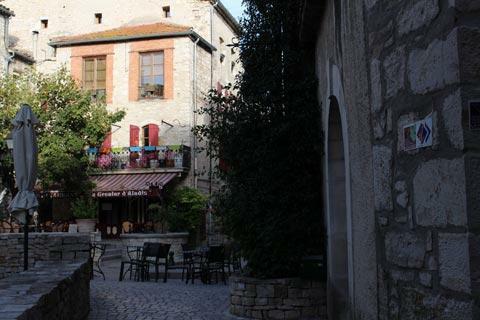 Facilities are quite basic here in Vézénobres but there are several small cafes and restaurants in various parts of the town if you need to escape the summer sun for a while. Back below the old village, the Chateau de Calvière in Vézénobres was built in the middle of the 18th century in the classical style, and stands in a large park. Note: the castle can be glimpsed from outside but is not open to the public. 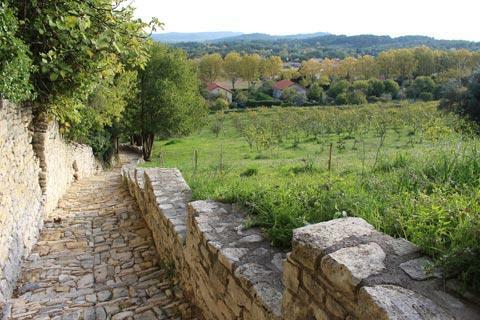 If you enjoy exploring Vézénobres we suggest you also find the time to visit Sauve, about 20 kilometres to the south-west of here. 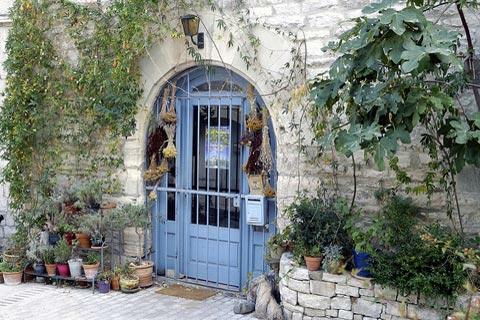 You can find more local travel ideas in the Gard guide and the Languedoc-Roussillon guide.